Facebook phone: HTC First on sale April 12 for $99 with Facebook Home preinstalled. Why Would Anyone Want a Facebook Phone? Because It Isn’t a Facebook Phone. The HTC First will be the first phone to come with Facebook Home preinstalled as the default home screen. Facebook has been insisting for months that it is not building a “Facebook phone,” but no one believed it. It turns out the company was telling the truth, technically. What Facebook has built isn’t a phone, but a piece of software called “Facebook Home,” designed to take over your Android phone by putting your Facebook feed and Facebook messages front and center. Facebook enthusiasts with certain Android phones can download it on the Google Play store starting April 12. But just because Facebook didn’t build a Facebook phone doesn’t mean there’s no Facebook Phone. Instead, everyone’s favorite (and least-favorite) social network has partnered with HTC and AT&T on a new Android phone called the “HTC First,” which will come with Facebook Home pre-installed as the default home screen. That, too, will be available on April 12. Because it’s cheap. 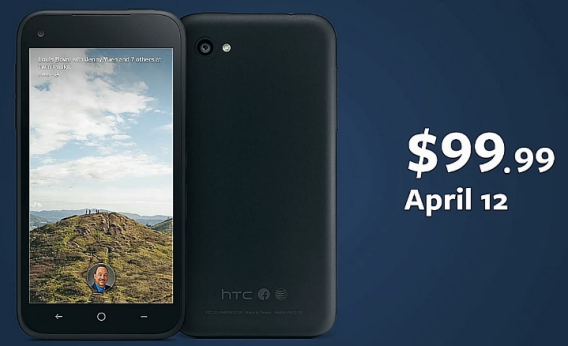 The HTC First will cost just $99.99 with an AT&T contract. Because you can finally stop checking Facebook all the time. Android users spend an average of 18 percent of their mobile-phone time using the Facebook app, not to mention Facebook Messenger and other Facebook services. Why not cut out the middleman and just load Facebook when you turn on your phone? Facebook Home replaces the home and lock screens with “cover feed,” a slick, image-heavy slideshow of the top recent posts in your Facebook feed. Because Chat Heads is more fun than normal text messaging. One of the key features of Facebook Home is “Chat Heads,” which pops your friends’ profile pictures up as little circles in front of whatever else you’re doing on the phone when they send you a text message, a Facebook message, or write on your timeline. It’s a playful and intuitive interface that’s both prettier and easier than flipping back and forth between the Facebook app and your phone’s normal text-message function. Because you really, really like your friends. The basic assumption behind Facebook Home is that you’d rather see what your friends are up to at any given moment than do things like check the weather or the stock report or Twitter or look something up on Google or on Yelp. You can still do all those things with Facebook Home, but they’re an extra click away. Because it isn’t really a Facebook phone. Perhaps the most reassuring thing about Facebook Home is that you don’t have to worry about the social network’s inexperience building phones, carrying voice calls, or designing operating systems, because they left those essential tasks to the experts: HTC, AT&T, and Google, respectively, in the case of the HTC First. Now, why would anyone not want a Facebook phone? That’s easy: Because maybe you’re just not that into Facebook.